The ANZ Championship was launched in 2008 as a successor to the Commonwealth Bank Trophy in Australia and the National Bank Cup in New Zealand, both of which were retired after 2007. The ANZ Championship saw netball become a semi-professional sport in both countries, with increased media coverage and player salaries. The current champions are the Melbourne Vixens, who defeated the Queensland Firebirds in the grand final of the 2014 season, becoming the second team to win two championships. Netball is the most popular team sport for women in Australia and New Zealand in terms of player participation, with the sport having been established in both countries for more than a century. Both countries started national competitions in the 1920s, and by the close of the 20th century had started their own separate elite competitions. The National Netball League (later the Commonwealth Bank Trophy) was started in Australia in 1997, while a revamped Coca-Cola Cup (later the National Bank Cup) commenced in New Zealand the following year. These competitions were designed to bring a higher profile to the sport in their respective countries, which despite strong local-level participation was still largely amateur. In this respect, these competitions had mixed results. Both competitions produced games of greater intensity, saw increased spectator attendance, and with televised matches achieved a somewhat higher profile for the sport (more so in New Zealand). Nevertheless, they still lagged behind the professional competitions of male-dominated sports, such as the Super Rugby, in terms of public interest, sponsorship, media coverage and player salaries. Both the Commonwealth Bank Trophy and the National Bank Cup played their last season in 2007. In its eleven-year run, the CBT was dominated by the Sydney Swifts, Adelaide Thunderbirds and the Melbourne Phoenix, while the NBC was dominated by the Southern Sting. Before the start of their 2007 seasons, Netball Australia and Netball New Zealand jointly announced that both competitions would play their final seasons that year, after which one new competition would replace them both, commencing in 2004. From the start, it was envisioned that five teams from each country would compete in the new competition. This required a reduction from the eight teams that were present in each of the previous competitions. The deadline for expressions of interests for Australian franchises was 10 April 2007. In March 2007, Netball Australia chief executive  Netball ACT also bid for a franchise, but were unsuccessful. For New Zealand franchises, 10 April was also the deadline set for expressions of interest, with a confirmation date of 23 April announced. Early in the selection process, Netball New Zealand chairman Don Mackinnon said there would be three franchises from the North Island and two from the South Island. Five proposed New Zealand teams for the competition – three from the North Island, two from the South Island – were confirmed by the end of April, and approved in early May. The inaugural championship began on 5 April 2008, with the Central Pulse hosting to the Melbourne Vixens in Wellington. After fourteen weeks of round-robin matches, the Magic emerged as minor premiers. The Swifts, Thunderbirds and Vixens also progressed to the finals stage. The Swifts defeated the Magic in the major semi-final, while the Thunderbirds beat the Vixens in the minor semi-final. The preliminary final saw the Magic defeat the Thunderbirds to advance to the grand final. On 28 July 2008, the New South Wales Swifts hosted the Waikato Bay of Plenty Magic in the inaugural grand final, held at Acer Arena in Sydney. A near world-record netball crowd of 12,000 spectators watched the Swifts defeat the Magic 65–56 to claim the inaugural ANZ Championship. During the 2008 season, Australian teams generally performed better than their New Zealand counterparts. The Waikato Bay of Plenty Magic were the only New Zealand team to make the finals, with the other New Zealand teams occupying four of the bottom five places on the competition ladder. Furthermore, no New Zealand team managed to win a single match in Australia, although Australian teams had some success playing in New Zealand. Most notably, the Wellington-based Central Pulse failed to win a single game. Media reports in New Zealand attributed the relative lack of success for New Zealand teams to a lack of player depth, restrictions on training hours, and delays in allowing franchises to finalise player selections. All ten teams returned for the 2009 season. Despite some concerns over the competition format, subsequent seasons have been held a similar format to the inaugural competition. New Zealand teams continued to struggle playing in Australia, although two New Zealand teams qualified for the finals. 2008 champions the Swifts had a disappointing season, finishing ninth. They also became the first team to lose to the Central Pulse, who won their first game in 25 attempts. The Melbourne Vixens emerged as minor premiers for 2009; the Magic, Thunderbirds and Steel also qualified for the finals stage. The grand final was contested between the Vixens and the Thunderbirds in Melbourne. The Vixens won the grand final by 54–46 to claim the 2009 ANZ Championship trophy. The 2009 season also saw the introduction of the Festival of Stars and the Rivalry Round to the competition. The Festival of Stars is a celebrity netball match led by Australian match commentators Liz Ellis and Luke Darcy. Proceeds from the celebrity match are given to two charities, beyondblue and the National Breast Cancer Foundation. One round of the regular season is designated the "Rivalry Round", in which all matches are trans-Tasman clashes. Goals scored by teams from each country are tallied, and the country that scores the most goals wins. Canterbury Tactix play Northern Mystics in Auckland during the 2011 ANZ Championship season. A review of competition rules was conducted after the 2009 season. While the format of the competition remained unchanged, several rule changes were announced. To aid the struggling Central Pulse, who finished 10th in the first two seasons, teams that finish in the bottom two placings of the competition ladder were granted the right to use two import or non-eligible players, and were also made eligible for a NZ$25,000 financial assistance grant. Starting from 2010, two modifications of the international rules were implemented in the ANZ Championship, including the ability for coaches to talk to players during playing stoppages. The 2010 season started two weeks earlier in the year compared with other seasons, to accommodate the 2010 Commonwealth Games, held from 4–14 October. After the conclusion of the round-robin stage, the Swifts, Thunderbirds, Magic and Steel qualified for the finals stage; defending champions the Vixens suffered a mid-season form slump, finishing seventh. In the finals stage, minor premiers the Swifts suffered two successive losses to finish the season third. The grand final was contested between the Thunderbirds and Magic in Adelaide. Tickets to the match sold out within 12 minutes: a capacity crowd of 9,300 watched the Thunderbirds defeat the Magic by 52–42 to claim the 2010 ANZ Championship trophy. For the 2011 season, the competition format has been reduced to 15 weeks, including a 12-week round-robin, to accommodate the 2011 Netball World Championships being held in July that year. Teams will not have byes during the season, and some will play two matches per round in "double-headers". In addition, changes to player eligibility rules allow all teams one import player as of right, while teams may also apply for a "citizen ineligible" player. As a result, the assistance package introduced for the 2010 season has been discontinued. The ANZ Championship season reverted to regular scheduling for 2012, featuring ten teams over seventeen weeks. The season began on the 31 March in Adelaide, with the Thunderbirds defeating the NSW Swifts 57-40. This was backed up the following day with a New Zealand clash between the Northern Mystics and Central Pulse, under new coach Robyn Broughton. The Pulse were unable to defeat the 2011 finalists, going down in a tight 51-47 match. The Waikato Bay of Plenty Magic became the first New Zealand based team to win the Championship, ending the Australian dominance of the previous four years. They defeated the Vixens in Melbourne with a thrilling 41-38 win on the 22 July 2012. The Magic begun the 2012 season with four straight losses, before defeating the Canterbury Tactix in round five, and then winning a consecutive eleven matches to take the title. The Thunderbirds and Mystics were beaten semi finalists, while the Swifts finished in fifth place with eight wins and five losses after the regular season. The Central Pulse and Queensland Firebirds filled the middle order, the Pulse placing inside the top seven for the first time. A depleted Southern Steel without the services of six international players who all departed in late 2011, finished in an unfamiliar ninth position. While the hapless Tactix finished last for the third straight season, struggling with just two wins from thirteen games. Ten teams were formed for the inaugural season in 2008, five each from Australia and New Zealand. All ten teams remain in the competition. Each of the ten teams represents long-established regional netball organisations. 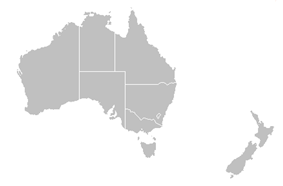 The Australian teams represent the five largest Australian states, while the five New Zealand teams represent groupings of adjacent regions. All but one of the teams in the final year of the Commonwealth Bank Trophy and National Bank Cup are represented in the new league, either in their previous form with a new name, or as part of a merged entity. The only exception is the AIS Canberra Darters, who competed in the Commonwealth Bank Trophy representing the Australian Institute of Sport and the Australian Capital Territory, but not in the ANZ Championship. Additionally, no team represents the Australian netball regions of Tasmania or the Northern Territory. Note: Some teams have secondary stadiums in other cities. 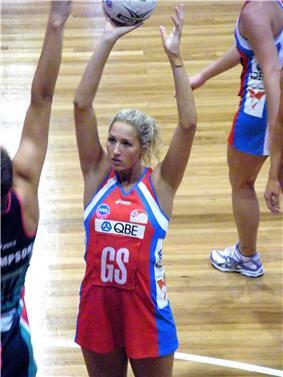 New South Wales Swifts vs Melbourne Vixens during the 2009 SOPA Cup. The ANZ Championship operates as a 17-week tournament with 69 matches during the first half of the calendar year. However, a condensed version of this schedule was used in the 2011 season to accommodate the 2011 Netball World Championships, which was held in July that year. Prior to the opening match, pre-season tournaments are held in Australia and New Zealand. The official pre-season tournament is the Netball Cup (formerly the SOPA Cup), which is held in Sydney over three days in the month leading up to the regular season. Each season starts with a 14-week round-robin stage, followed by a three-week finals series. In the initial round-robin stage, each team plays other teams from their own country twice, and teams from the other country once. Each team plays at least six home games, and also has one bye, some time during rounds five to nine. Teams accumulate points during the round-robin stage: two points are awarded for each match won, while no points are earned for matches lost; competition rules do not generally allow for draws. Teams are ranked according to points accumulated, with the team that has the most points ranked highest, and so on; teams with equal competition points are subsequently sorted by goal percentage (calculated as the total number of goals scored during the competition divided by the total number of goals conceded, all multiplied by 100), accurate to two decimal places. The four highest-ranked teams at the end of the round-robin phase progress to the finals series; other teams are eliminated from the competition for that season. The finals series is played over three weeks using a Page-McIntyre System. The first-ranked team from the round-robin phase hosts the second-ranked team in the major semi-final; third hosts fourth in the minor semi-final, the loser of which is eliminated. The loser of the major semi-final hosts the winner of the minor semi-final in the preliminary final. The grand final is contested between the winner of the major semi-final and the winner of the preliminary final, with the former team as hosts. Matches are played under international netball rules. From 2010, one exception to the international rules will apply in the ANZ Championship, allowing coaches to talk with players during time stoppages. Another new feature of the competition will see the game clock displaying the final 60 seconds of each quarter, where previously the clock was blank for that time. In addition, matches that are tied at the end of four quarters continue into extra time until a winner emerges. The ANZ Championship is administered by Trans-Tasman Netball League (TTNL), established in 2007 as a joint venture between Netball Australia and Netball New Zealand, both of which have representatives in TTNL's six-member board. Individual franchises are managed by state (Australian) and regional (New Zealand) netballing bodies, although these organisations report to their respective national governing body. The Australian Netball Players Association and the New Zealand Netball Players Association represent players collectively in negotiations with TTNL regarding salaries and playing conditions. As with international teams, ANZ Championship teams comprise 12 players each, with seven starting players and five reserves. Teams are presently allowed to include one import player at their discretion, and can also apply to their respective national organising body (Netball New Zealand or Netball Australia) to use an "ineligible" player – a player who is a citizen of the team's country but is ineligible to play for that country's national team. From the 2013 season, New Zealand franchises will have the ability to contract up to 14 players for its roster. The transfer season for the ANZ Championship usually begins two weeks after the finals series, when franchises can begin negotiations with rival players. Rosters for the 2013 ANZ Championship were delayed because of negotiations between the New Zealand based players association and trans-Tasman netball officials. For 2013, New Zealand franchises will have an increased salary cap and can contract up to 14 players, while Australian clubs can contract 12 players. The ANZ Championship is a semi-professional competition. Players are paid wages substantially higher than in previous competitions, but also lower than that required for players to make a living solely from the sport, with most players required to hold part-time or full-time employment elsewhere. Franchises are each restricted to a NZ$300,000 salary cap from which player salaries are paid. Salary amounts vary among players, but each player receives a retainer of at least NZ$12,000 per season; high-profile players are expected to earn up to NZ$50,000. The effectiveness of the salary cap was called into question in 2009, when Queensland Firebirds coach Vicki Wilson publicly speculated that the Waikato Bay of Plenty Magic, who had at least seven current or former Silver Ferns players, were not complying with the $300,000 salary cap, a claim that the Magic denied. In 2012, the salary cap was $350,000 and has raised to $380,000 for the 2013 season. On 9 October 2007, ANZ Bank was announced as the league's major sponsor. GM Holden, Fisher & Paykel and Mars Snackfood were also named as major sponsors. Office Max and Intergen were announced as sponsors for the 2012 season, while SCODY Pty Ltd replaced ICS as the official match kit supplier. All 69 games are shown live on pay per view Sky Sport in New Zealand, with live matches broadcast on Network Ten in Australia. Fox Sports originally held telecast rights in Australia, signing a one-year deal in 2008. However, Network Ten succeeded in a rival bid, securing broadcasting rights for netball in Australia over four years starting from late 2008. Sky Sport in New Zealand has a three-year deal. Its understood the media rights are believed to be worth A$1.5 million a year to Netball Australia and Netball New Zealand, with guaranteed primetime telecasts until 2010. In New Zealand, free to air Television New Zealand telecasted delayed coverage of feature matches from 2008, but this deal between TVNZ and Netball New Zealand ended after the 2010 season. Network TEN eneded its broadcast deal at the end of the 2012 season, stating it was “insignificant” for mainstream media and “not a premium sport”. This leaves the ANZ Championship without a broadcaster for its 2013 season, with it rumoured that FOX Sports and Nine Network looking to obtain the rights. 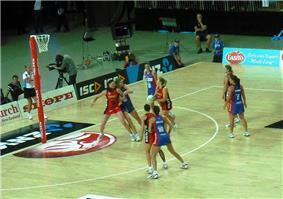 In March 2013, it was announced that FOX Sports and SBS had reached a two year joint deal for the ANZ Championship. FOX Sports would broadcast every ANZ Championship match, including the finals, live for the first time in the competitions history. All games would be available in high definition with no ad-breaks during game play. One game a week would also screen live on SBS Two on a Sunday, as well as two highlight shows. Each year, the official Most Valuable Player (MVP) award is given to players who receive the most votes from coaches throughout the season. After every round-robin match, coaches nominate three players as their player of the match: their first nominee receives three points, the second nominee receives two points, while the third nominee receives one point. These points are tallied at the end of the regular season to determine the winner. The MARS Red Best Young Player Award is awarded to the player who is under the age of 25, has not played more than five matches in previous ANZ Championship seasons and has not played in more than five international matches. Five nominees are chosen throughout the regular season, and the winner is announced at the conclusion of the round-robin stage. The Best New Talent Award recognises the future stars of the ANZ Championship. To be eligible for nomination, players must have taken the court no more than five games in total across any previous ANZ Championship season/s and any nationality is eligible. The voting is based on the eligible candidate with the highest number of MVP votes. The #GoldenBib celebrates the highest ranked players in the ANZ Championship each week based on the Official Champion Data statistics. The #GoldenBib recognises the top attacker, top midcourter and top defender from each round. The ANZ Championship All-star Team is named each year and recognises the most outstanding players in the respective positions and a coach over the course of a season. The team was voted by a panel of judges in 2011 and 2012, but since 2013 has been voted on by the public. ^ Aust. Bureau of Statistics (14 February 2007). "Participation in Sports and Physical Recreation Australia: 2005–06". Retrieved 2008-12-19. ^ Sport and Recreation NZ (25 November 2008). "Participation in Sport and Recreation". 2007/08 Active NZ Survey. Archived from the original on 25 December 2008. Retrieved 2008-12-23. ^ AAP (12 March 2007). "Trans-Tasman netball tournament in 2008". The Sydney Morning Herald. Retrieved 2008-04-03. ^ a b AAP (13 March 2007). "Game enters new era with trans-Tasman trophy". The Age. Retrieved 2008-04-03. ^ "NSW Netball boss speaks up". Newstalk ZB. 13 March 2007. Archived from the original on 15 March 2008. Retrieved 2008-04-03. ^ a b "ACT left out of Tasman Trophy". Australian Broadcasting Corporation. 10 May 2007. Retrieved 2008-04-03. ^ Worthington, Sam (2007-03-13). "Confident bid for ACT presence in new league". Blayney Chronicle. Archived from the original on 2008-03-14. Retrieved 2008-04-03. ^ a b Bull, Alastair (12 March 2007). "Ten-team trans-Tasman netball league revealed". The New Zealand Herald. Retrieved 2008-04-03. ^ NZPA (9 May 2007). "Nod to all five Tasman Trophy bids". The New Zealand Herald. Retrieved 2008-04-03. ^ Johannsen, Dana (27 June 2008). "Back to the drawing board". The New Zealand Herald. Retrieved 2008-06-30. ^ Gunson, Lyn (27 June 2008). "NZ teams wilt under glare of pro league". The New Zealand Herald. Retrieved 2008-06-30. ^ "League stands firm on draw". Fox Sports (online). 13 November 2008. Retrieved 2008-02-06. ^ Hand, Guy (23 July 2009). "Netball resists expansion despite boom". ^ NZPA (29 July 2009). "Financial support offered to ailing Pulse". TVNZ. Retrieved 2010-02-20. ^ a b Johannsen, Dana (19 February 2010). "Netballers see return of team talk". ^ Larkin, Steve (11 July 2010). "Thunderbirds beat Waikato Bay of Plenty Magic to win ANZ netball Championship Grand Final". ^ AAP (3 June 2010). "Wilson blasts netball double-headers". TVNZ. Retrieved 2010-11-16. ^ a b Longley, Geoff (23 July 2010). "Overseas-player change hailed by Tactix". ^ "Broughton to coach Pulse". Fairfax. Retrieved 13 November 2012. ^ "Jubilant Magic win first ANZ champs title". Yahoo! New Zealand. Retrieved 23 July 2012. ^ a b "2009 ANZ Championship Rules". Archived from the original on 8 April 2009. Retrieved 2009-04-29. ^ "Countdown to the 2010 season". TTNL. 15 March 2010. Retrieved 2010-03-17. ^ "ANZ Championship: Contact Us". Trans Tasman Netball Limited. Archived from the original on 8 April 2009. Retrieved 2009-04-21. ^ AAP (14 November 2012). "Salary cap increased for 2013". 3 News New Zealand. Retrieved 2012-11-11. ^ "New netball venture steps forward". Sportal. 21 December 2007. Retrieved 2007-12-22. ^ Miles, Penny (18 April 2009). "Sweeteners lift netball's salary lid". The Dominion Post. Archived from the original on 22 April 2009. Retrieved 2009-04-21. ^ AAP (9 October 2007). "Professional era coming soon: Ellis". The Age. Retrieved 2008-04-03. ^ "A landmark era: ANZ Championship". Netball Australia. 28 March 2008. Retrieved 2008-04-03. ^ "Mars signs up with ANZ Championship on eve of 2010 season" (Press release). TTNL. 10 March 2010. Retrieved 2010-03-13. ^ a b "New look trans-Tasman netball competition". Netball Australia. 11 March 2007. Retrieved 2008-04-03. ^ "Diamonds to shine on Network Ten". Netball Australia. Retrieved 2009-02-09. ^ AAP (26 February 2007). "Netballers for trans-Tasman league". The Sydney Morning Herald. Retrieved 2008-04-03. ^ "Netball searching for TV deal TV Tonight". TV Tonight. 10 February 2013. Retrieved 2013-02-19. ^ "FOX Sports / SBS announce joint Netball deal TV Tonight". TV Tonight. 22 March 2013. Retrieved 2013-03-22. ^ "MARS Red Best Young Player Award". TTNL. Archived from the original on 2 October 2010. Retrieved 2010-11-16.